Celebrating a Traditional Indian Birthday! 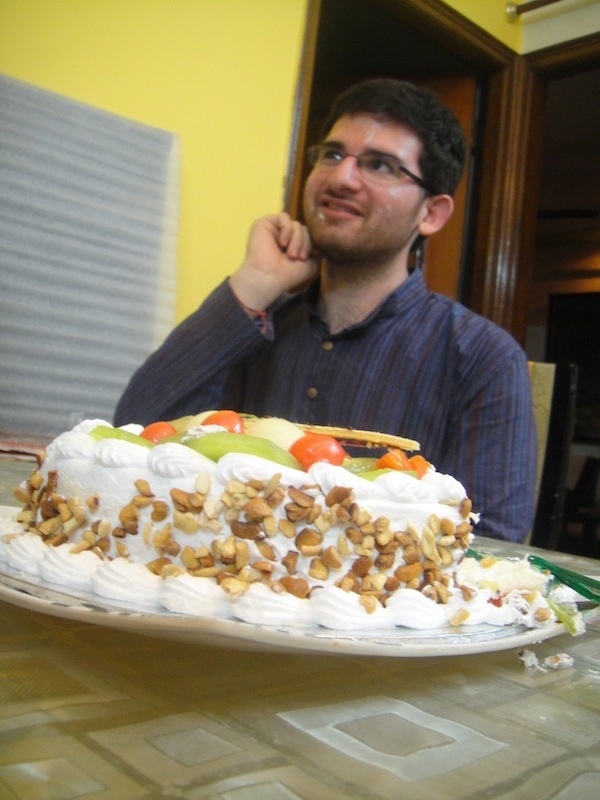 Today, I am celebrating my birthday through the traditions of Indian culture here with "Ek Koshish, One Attempt!" When I woke up, I practiced a sacred Hindu tradition, where young men bend down and touch the feet of the elders for whom he has the utmost respect. Usually, my elders in India, with whom I practice this custom, stop me before I reach their feet, which they practice out of respect for me, saying "Khush raho, beta" ("Stay happy, my child" in Hindi). After a special mug of chai, in the "birthday mug" (an especially large mug for the birthday boy, as my host family described), the family has been showering me with little gifts and treats. Everybody, even including our students from our school, has been wishing me a "Happy Birthday," or "Janam Din Mubarak," as we say in Hindi! 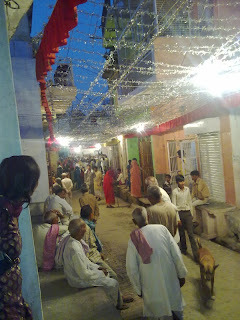 The family I have been staying with has made many preparations for this special day for me: Apart from the surprises unbeknownst to me, today we will be going to a Hindu temple, for "Darshan," which translates to "Visit/View" in Hindi, specifically for visiting a temple, God's home, in this case. During the day, I will go with my "bhaiya" (Hindi word for "brother," but used among friends as well) to the markets in India, where we will buy some food and a cake for the evening. When our students can arrive to the "davat" (the word for "party" in Hindi) at dusk, we will host a special meal for all of our students, in honor of my birthday. In India, charitable acts, especially involving feeding the hungry, are highly venerated, which is why the host family with Ek Koshish would like to celebrate my birthday by giving back to the community! Otherwise, I have posted this picture above, which was taken during my favorite Indian holiday, "Holi," in Mathura (a city a couple of hours south of Faridabad by car). This is another example of a "davat!" I am excited and looking forward to these unique birthday festivities! Yesterday, the team at "Ek Koshish, One Attempt" donated various clothes, toys, and other contributions to a very needy family in a nearby slum in Delhi NCR. Four days ago, a baby boy in the slum was born: His aunt, Nancy, one of our students that we have been educating at our school for teaching the poor and illiterate to read and write (see picture above), told us about her sister's birth, so the Ek Koshish team decided to purchase all of the items that we donated to him and his family. This newborn has not been named yet, but his mother was elated to see that, from the beginning of her son's life, he is surrounded by people who care about him. The family is so poor, that they did not have any clothes for the child. About the size of an adult hand, the baby was very cute, but very thin, fragile, and weak. We are optimistic that this child, like his aunt and neighbors, will be able to come out of a life of living in the slums, once they obtain proper education and support from our NGO. It was a very happy Father's Day for everyone here at Ek Koshish, One Attempt! Being here in India for this holiday, I learned the following phrase today: "Father's Day par haardik shubh kaamnaayein!" ("We sincerely wish you a Happy Father's Day!" in Hindi). I have been learning so much Hindi and about Indian culture in general since I started volunteering with "Ek Koshish One Attempt," and I wanted to take the time to discuss one topic I found very interesting. Seeing Indian people's utmost respect for other life forms, especially cows, has been a touching experience for me. People are always conscientious about feeding plants and taking care of one another: As I mentioned earlier, we feed cows every morning, and we feed stray dogs every night. Another tradition that some people follow here is similar to what we call "Tzedakah" in my culture, Judaism. This picture shows the equivalent of a "Tzedakah box," a collection in a home, which will be given to a charitable cause. This charitable cause is specific to taking care of cows in India. Every day the team at Ek Koshish and I have been filling some money into this box, which will be sent to the charity on a subsequent visit. The bottom of the box has a lock, to which only the charity itself has a key. When I spoke to the teacher from our new program, where we teach illiterate children to read and write, she told me that one of our students (Mohini), a poor maid in Faridabad, believes in the cause too, donating what little she can. It is a real inspiration to see the care and love all people have here for one another, whether human or otherwise. I hope more people will come and volunteer here with Ek Koshish, as this has been the best way for me to learn Hindi and give back to a community in need! Happy Father's day everyone, and especially Happy Father's Day to the fathers in my family: Papi, Zayde, Tío Roberto, Tío Albert, Tío Ramon, Tío Alberto, David, Mario, Isaac, Freddy, Tío Charlie, Alan, Phily, Sal, Israel, Gil, and Uncle ji! Children from Slums in India Memorize English Counting! Two days ago, Ek Koshish continued with its classes for children from slum areas in Delhi NCR! The classes went very well, as we noticed that the children, mostly, remembered how to count from one to five in English! 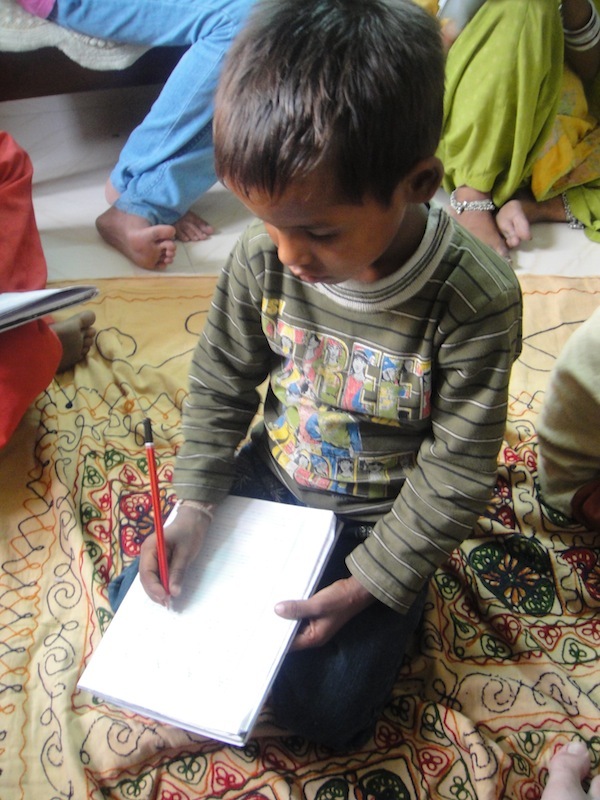 Watch the video to see Badal, the youngest child, practicing his numbers! We are very happy to see that our work has had sticking power with even the youngest of the children, as they are still a bit too young to memorize and differentiate the symbols for "1," "2," etc. Vicky, the eldest of the boys, can now write the symbols for one, two, and three, from memory, always producing the correct symbol upon request! Badal is unable to write any of the numbers besides one, and he still struggles while holding the chalk for his chalkboard. Ajay is a bit stubborn, and when he has had enough of the work we give him, we have to find other ways to interest him in his studies: For example, we had all of the children count their numbers in English aloud, which encouraged Ajay to join in the group as well. With the younger children, we have to stick to a very slow pace, as they are not accustomed to reading or processing information from written symbols. Nancy's work is very inspiring for the Ek Koshish team to witness, as she has memorized counting, one through ten, along with the corresponding symbols, in just three short lessons. We also began teaching her some English vocabulary, along with the first four letters in the alphabet, which she practiced well on her first few attempts. Her progress, aptitude, and attitude have all been very promising. Mohini had some work to do for her family, so she was unable to come with the other new students. Also, we purchased more equipment for the children, including books to help the children practice stenciling their numbers and English and Hindi letters! Finally, at the end of the class, we treated the children to a classic Bugs Bunny episode, to which they roared with laughter! Sharing these pictures of the children enjoying the cartoon is our way of thanking you for reading our blog! Illiterate Children Write for the First Time! Yesterday evening we had our second day of classes for the women and children from slum areas in Faridabad! The children arrived a little late, but they got to work right away. First, our teacher distributed some personal-sized chalkboards to each of our students, which they enjoyed very much! The smaller children practiced counting English numbers and writing the number "1" on their boards. Vicky was a natural with his chalk, and he even moved on to drawing the number "2." I have never seen a child take more interest in drawing the same number, repeatedly, at any angle, as I have seen Vicky! Badal was just getting the hang of how to hold the chalk and write properly, so we could only have him practice the number "1." Ajay was pretty good at drawing, like Vicky, but he has less patience, so we moved on to listening exercises with him, while the rest continued practicing writing with chalk. Nancy was very good at learning numbers, as she practiced writing each number for the first time, while saying each number's English translation while she wrote. Mohini already knew how to write numbers, but she did not know any symbols from the English or Hindi alphabets: so, we taught her ten symbols, and practiced each of them one by one with her. After mixing up each of the symbols, she was still able to distinguish the correct characters and their appropriate pronunciation. Otherwise, most of the children came dressed in better clothing, which was a nice surprise to see that they have some emotional support from their family to acquire education. When the children first arrived, I took some pictures of them with my camera, and then showed them the photos: Ajay erupted in laughter, his only reaction to seeing a photo of himself for the first time! Every photo we showed the children resulted in Ajay's bursts of laughter, which rang like music to Mohini's (his mother's) ears. At the end of the day, we played for them a Wile E. Coyote and Road Runner cartoon, which they relished! They had never once seen a cartoon or computer in their lives, and it was a special moment for the Ek Koshish team and I to witness their bliss. I wish we could do more to give these children, and all children living in shambles, back their childhood, which too many of us take for granted! Indian Children from Slum Areas Enjoy Ek Koshish's Orientation Program! Yesterday evening, "Ek Koshish, One Attempt" commenced its newest project: tutoring a group of women and children from slum areas of Faridabad, Delhi NCR! We began our classes with five students, whose names are Mohini (about 22 years old), Nancy (about 11 years old), Badal (about 3+ years old), Vicky (about 4+ years old), and Ajay (about 4+ years old). They come from such poor backgrounds, such that nobody keeps track of their birthdays or ages, which is why we have to approximate their ages. The eldest, Mohini, wanting to escape from her miserable lifestyle, would never like her son, Ajay to be illiterate at any cost either, which is why she came with her son to our orientation program. The others, Nancy, Badal, and Vicky, whose parents, like Mohini, remain busy throughout the day, unable to keep track of their children because of their work. Even Nancy, at such a young age (about 11), forcibly had to adopt a maid's job in Faridabad, by visiting different homes to sweep houses, mop floors, and wash dishes. Because of her work, we have to arrange the classes in the evening, so that she can continue to support her family. It is heartbreaking for us to witness such a young child with the responsibilities of an adult; but we are working towards teaching her not only to read and write in Hindi and English, but also some to teach her professional skills geared towards her interests, so that she may one day respectfully earn and support herself and her family independently. Mohini and Nancy shamefully admitted that they had never learned how to read or write, not even the first Hindi character in our "prathmik gyan" (a phrase that roughly translates to "alphabet" in English), which inspired them to seek help from us. As we conversed with them, we learned that they wholeheartedly want to come out of their cursed lives and gain respect via education and sharpened professional skills. We feel that they will pick up the subjects quickly, because of this immense interest in learning, to better themselves along with society. To give more background about the other students, the boys, for the most part, spend their days wandering aimlessly and even playing in dangerous, sometimes life-threatening areas, where nobody pays attention to safety or hygienic needs. The three boys don't take baths regularly and are unaware about how to use toothbrushes for cleaning their teeth: we observed that their teeth were in poor conditions, having bad odor and yellow to even some black teeth. With their hygiene as a top priority, we decided to provide them with necessities, i.e. toothbrushes, toothpaste, soaps, clothes, shoes, toys, and even sports equipment, which would be required for their all around development in the future. During our long chat with them, we found them to be quite interested in these ideas, should such amenities and facilities be provided to them. We have purchased study material for the children to use to practice their alphabets (English and Hindi), drawing and stenciling exercise books, initial textbooks, and school bags for each of the students. We have purchased sports equipments like badminton and table tennis (or what people call "Ping pong" in the US), and we shall introduce them to various games for their recreation and physical fitness. We believe that games always play an important role in building one's character and personality. Otherwise, once we introduced ourselves and explained that we wanted to work with them as often as possible, offering chocolates, candies, and biscuits to the children during our classes, the elder children understood that our interest was in preparing them for their own successful futures. We began our lessons with Hindi and English counting: In the beginning they showed no interest, but later on, when we introduced the element of sweets as positive reinforcement, they took an interest in practicing counting. It was amazing to see that they started pronouncing English and Hindi numbers clearly and promised us to come regularly to our classes. At the end of the lesson, we taught days of the week in Hindi and English. We could easily detect their joy in hearing themselves pronouncing these foreign, English words. Hesitant and a little shy in the beginning, the children soon opened up and enjoyed the lesson, especially as they savored the sweets with which we rewarded them. When we asked them about their ambitions in the future, it was surprising to us to hear that Badal wanted to become a pilot, and others too wanted to operate trains and drive big cars. Their dreams emotionalized us to a greater extent. We wish that all of our students grow into great, honorable people in the future. We anticipate that we will have a class of eight or more students from tomorrow onward, as we expect other students from similar backgrounds. We will give more updates about our progress in the mission as we continue with our "Ek Koshish, One Attempt." I wanted to dedicate this post to discuss the hardships of the students who attend the charitable school where I have been volunteering. If you have been keeping up with the Ek Koshish blog, I have not been teaching there during the month of June, because it is currently their summer vacation; but, starting July 1st, we will be starting classes again, and I will continue my English grammar lectures with the help of a Hindi-speaking English teacher. 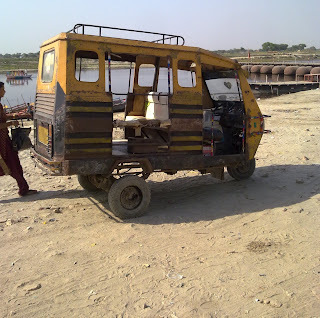 Everyday at the end of school, I would wait outside for a "rickshaw waala" (what we call the person who drives the "rickshaw," depicted in the photo above) while the children, who would hang around school after classes finished, would engage in conversation with me. The children explained how they really enjoyed coming to school, since they have a safe place to play with their friends, eat two meals, learn computers, and relish other entertaining subjects. Originally the children were not so interested in learning English, but, after my arrival, many of them felt urged to learn more English so that they could interact with me and learn more about the world outside of their little village in Faridabad, Delhi NCR. The students also explained that, though there is a bus that many students use to go home, not every student can be picked up by the bus: They have to walk about ten kilometers (approximately 6.2 miles) every day to school, in the blistering heat of 50˚C (122˚F), each way. It was a rude awakening to hear about their rough lives every day, considering that they enjoy walking to school, because home must be that much worse. In many cases, the children's parents cannot afford to feed the children at all, and so the children go each day to eat two meals per day at the school, apart from Sundays, when the school is not open. It is my dream that these brave Indian students can be successful and can communicate fluently in English: Until then, my work here won't be done! This week, I went with the chairperson of Ek Koshish to learn about the leprosy colony in Faridabad, before we visited an all-girls' orphanage in Sector 15 of Faridabad, by the name of "Arya Kanya Sadan" (Hindi for "Communal home for girls [founded by the Aryas]"). At the leprosy colony, they explained to me how their charity initiated: In 1990, the government donated land in Faridabad to the people (and to family members of people) afflicted with leprosy. Foreigners and other rich benefactors, who supported the cause here in India, built the structures on the government-donated land. One of the structures, the hand loom shop, was donated by the German Relief Fund for Leprosy, along with dozens of machines used to make different types of fabric. The person running the shop explained that his parents were leprosy patients too, but they had passed away. Most of the workers are patients suffering from leprosy, but some of them have a relative who suffers from the disease. Nowadays, thanks to several health camps and intervention from the government, the number of families affected by the disease has dwindled only to 105 families. Afterwards, we visited a cow shed, operated by the people living in the leprosy colony, who sell the milk they produce from the cow shed to earn for the residents and for the organization as a whole. Heading out of the cow shed area, we found some of the leaders in the community, whom we asked if I could begin teaching some classes to the children after school. They were happy to accept my services, and we may be organizing the classes in the near future! 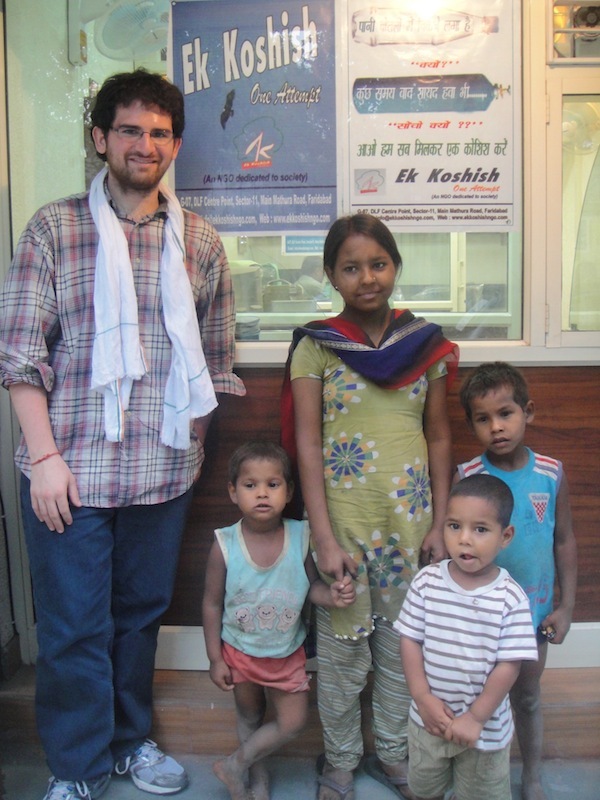 Otherwise, they also suggested that we visit the orphanage in Sector 15 of Faridabad, "Arya Kanya Sadan." There, the warden was happy to see my interest in teaching her students, of which there are ninety one, and I would focus my coursework on English grammar and conversational English classes. Now we are in the process of seeking permission to organize my classes in the orphanage as well. It may be difficult for me to get permission to teach at the orphanage, because it is an all-girls' orphanage. Even if I am unable to get the opportunity to teach at Arya Kanya Sadan, I am looking forward to all of the work and different ways through which I can reach out to this community and help the truly neediest of people! Yesterday morning, I had the pleasure to partake in a daily Indian custom with the secretary of the Ek Koshish team! Every morning, when people make "Roti"(traditional Indian flat bread, similar in shape to pita bread, but much thinner), the very first roti that they make is supposed to be saved for cows and bulls, who may come by the house in the morning. In case a cow or bull does not come by during the day, they save the bread for the next day, as I found out after having asked the question. A cow or bull doesn't usually just eat bread that someone holds up to its mouth: A person must affectionately offer these creatures the bread, while petting them and tenderly interacting with them. As cows are considered to be the archetypal mother-symbol in India (because it freely gives us milk, just like our own mothers did), Indians say that they offer cows and bulls this roti as a part of their spiritual duty, or "Dharm". As I learned more about this tradition while speaking with the rest of the team with Ek Koshish, they explained that there is another tradition they follow at the end of the day: The very last roti that is made at night, is to be saved for dogs. In feeding dogs, we play our role in society by keeping in mind to help the needy and hungry, a responsibility called "Karm." Though these words Dharm and Karm have very profound meanings, through this way every morning and every evening we remember that there are two essential types of obligations that we have as human beings: those to our mother, or more broadly, to the one who created us, and those to our fellow brethren. On behalf of our team at Ek Koshish, we would like to wish everyone a "Shubh Paryavaran Divas," or Happy World Environment Day! In honor of this day, we have launched a new promotion today: The picture above is our plea for help, beseeching the public to consider our current state of affairs regarding the environment. The translation of our message reads, "Just think. People have started selling water in bottles. Why?" Then, the message reads, "Maybe shortly air too will be sold similarly. Why not?" The final part of the message calls on the public, "Come, let's all work together and make one attempt." Basically, we see a free, natural resource packaged for us daily, because of our consistent disregard for maintaining our precious bodies of water. Now, consider a future, when breathing through oxygen tanks will be as common a habit as drinking from water bottles. Though some may argue that the comparison of these two images is an exaggeration, Ek Koshish firmly believes that we must preserve our environment and be the change, or else pollution will drastically affect the world in which we will live in the future. We will be distributing the message as weather-resistant stickers for people to adhere to cars, windows, or other surfaces, so please let us know if you would be interested in spreading the word of our new promotion in honor of World Environment Day, and we would be happy to mail the sticker to you! A few days ago, our volunteer from the US visited Vrindavan, an Indian city known for it's historical and religious heritage, with his friend who was traveling in India. The volunteer had much to say about the city, as we advised him about the different sites to see. The first picture was taken on the Yamuna River, one of the most important rivers in India. Justin ji, our volunteer, describes how on one level, it seemed so distant and isolated from the rest of India he had ever seen, yet the first picture also epitomizes how people very often compromise their own safety for the sake of completing a job as quickly as possible. 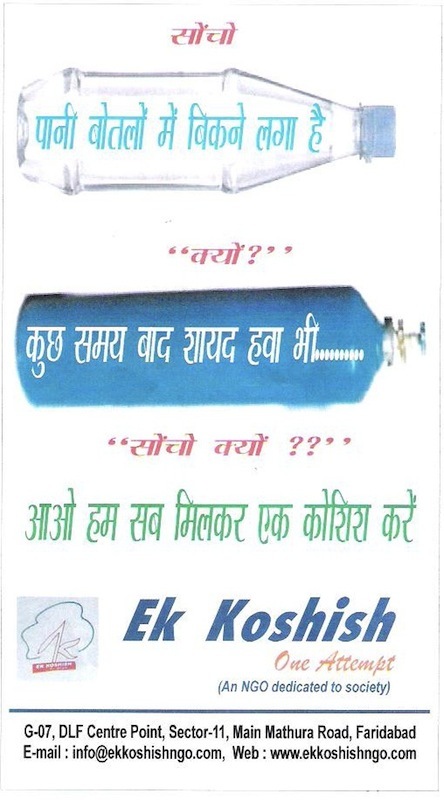 We at Ek Koshish would like to raise awareness of safety concerns to drivers, or even civil engineers, to create safe and sustainable infrastructure with the welfare of Indian residents, or foreigners, at heart. Justin ji took the next picture on the Yamuna river as well, as the sight of turtles was a pleasant surprise! Ek Koshish's programs revolve around preservation of the environment and animals, and we would like to keep the public eye aware of environmentalist concerns. The last photo was a very rare and special photograph, taken in a garden of basil plants, or what we call "Tulsi" in Hindi. Being the most sacred plant in all of Ayurvedic Medicine, these basil plants are said to have existed for thousands and thousands of years. Observing the plants, they also have grown into majestic trees, which neither the volunteer, nor his friend, had ever conceived possible! They both remarked that the garden was, by far, the highlight of their journey! We are happy to have helped our volunteer and his friend enjoy seeing but some of the sites in the mystical city of Vrindavan! Just a few days ago it was my last day at the school for impoverished and needy children in Faridabad, until the end of the summer vacation, which is fairly short in India: By July 1st, I will be back at the school in my normal schedule. Over the break, I have been working on my lesson plans, now that I have a feel for the students' capabilities in each grade level. Eighth grade is quite good at picking up grammar concepts in English, especially learning new tenses, so I will continue working on more helping verb constructions with them and finish up tenses for now in their classes. Afterwards, we will move onto clauses, but we will start with some basic subordinate clauses and work our way from there, as I see fit. The seventh grade class is not as quick on picking up tenses or working on prepositional phrases, so I will continue to review all of the tenses with those classes, as well as more practice with prepositional phrases. Hopefully before I leave India in October, we can start to introduce some more topics in grammar, but I think for now that subordinate clauses may be a bit too difficult for them, as they have a hard time being able to differentiate the subject of a sentence, the verb of a sentence, and other objects in a sentence. The sixth grade class is a very clever group of children, and we may even get to more advanced material before the seventh grade class, but I will play it by ear for now. We will continue working on new tenses and recognizing parts of speech. In the fifth grade class, they still have trouble recognizing nouns, adjectives, and verbs, so I will make some worksheets for them, which in which they will circle nouns, underline adjectives, etc. This should help them for more difficult topics to come in the future, like prepositional phrases and adverbs. Finally, the fourth grade class is very weak in English, as many of the students have been held back for many years, or have not had access for many years until now. As such, I will continue working on adjectives and nouns, as these two topics are somewhat strong for them in Hindi, but they cannot grasp a correlation with Hindi grammar and English grammar, which is quite evident in terms of adjectives and nouns. Otherwise, I have another picture from when the doctors were giving checkups to the students. The last day at school was especially touching, as the children literally touched my feet, a sign of high respect to elders in Indian society. It was a moment I'll never forget, being a part of a wonderful tradition for my efforts working with these eager to learn students. I have high aspirations for these determined children, and hope that with my work here in India, they can be inspired to make names for themselves in society, whether in India or even abroad. Let's see how my English classes on July 1st go!